Once Grub Street New York had shared that Chef Keller was rolling out a series of family-style, three-course meals (dubbed Friday Feasts) at Time Warner Center's Bouchon Bakery from mid-August through September, I knew it would be something worth looking into. After checking out the predetermined menu for each of the Friday Feasts dinners, Marcus and I both were intrigued by the first installment on August 17, so we made a "fancier" date night (ooh-la-la) out of it. We had been to Bouchon Bakery before in 2011 for lunch after celebrating Macaron Day that year and enjoyed it very much, so we had a feeling that we wouldn't be disappointed one bit. Marcus and I arrived a few minutes before 6 PM (i.e., when the Friday Feasts dinners begin, running until 9 PM), so I got this quick shot of the restaurant's sleek dining space. 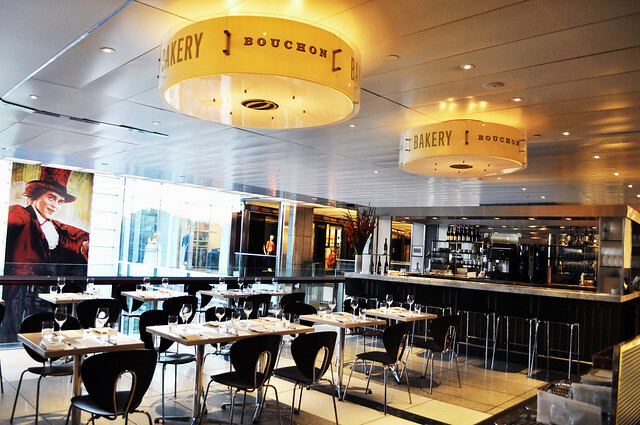 I love how the lamps serve as Bouchon Bakery's restaurant signage as it essentially is a wall-less restaurant on the third floor of the Time Warner Center. Once the clock struck six, we were seated promptly. Our napkins were covered with the Friday Feast menu, which was set and the only courses offered for the evening. 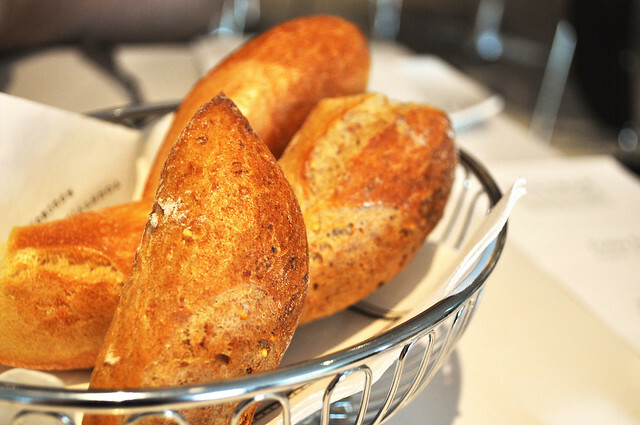 Bread basket with miniature baguettes, made from the bakery part of the restaurant. The baguettes had a crusty exterior while the interior was quite soft. It went delightfully with the accompany fresh butter topped with fleur de sel. 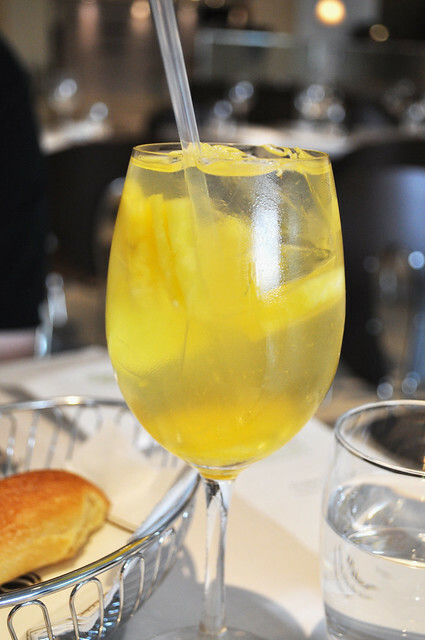 I had a glass of white sangria -- sauvignon blanc with pineapple and mango chunks. It was blander than I would've liked -- wish it was a little fruitier -- but still decent. The first course of our Friday Feasts dinner was a frisée salad with smoked salmon, red radishes, and ruby red grapefruit suprêmes topped with some freshly ground pepper. Given my natural stance on frisée (see this manifesto by Amateur Gourmet, Adam Roberts), I had reservations at first. It always turns out to be a bitter fight (pun intended) in my mouth, and for the most part, I've come to the conclusion that I should just avoid it at all costs. But in my attempt to become a less finicky, more adventurous eater, I put my intolerance aside, and I just went for it. I also trusted Chef Keller and his team to craft some wonderfully tasting dishes here, so on some level, I knew TK would have my back. So lo and behold -- my faith in TK and his enterprise goes again unfaltered. 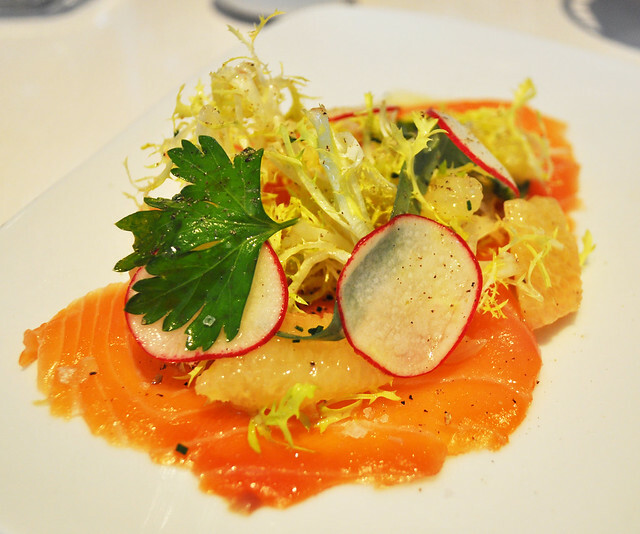 The salad was the perfect balance of savory (smoked salmon), tart (grapefruit chunks), and bitter (frisée leaves) with a textural highlight from the juicy and snappy radish slices. The best part of this dish was its simplicity -- the composition allowed for each of the ingredients to highlight its best flavors forward. 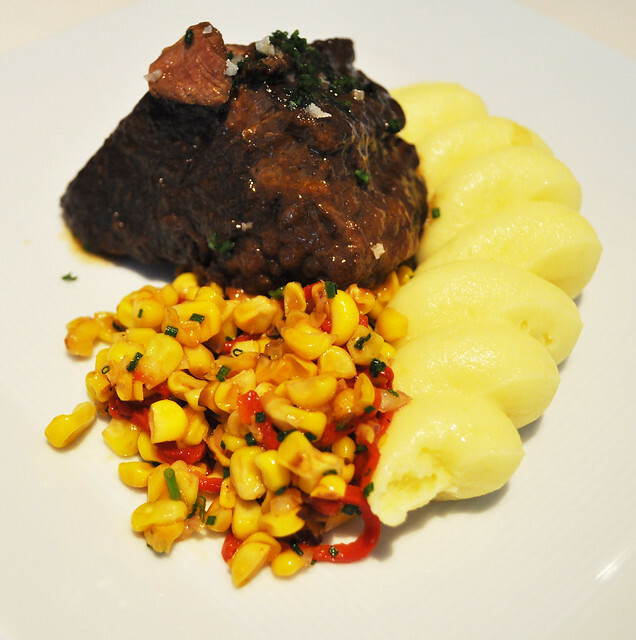 For the main course, the menu proceeded with braised beef shortribs served with pomme purée and sweet corn relish. The shortrib was braised to a soft and tender medium which was countered really well by the creamy, whipped pomme purée and the sweet-and-briny relish. By using seasonal sweet corn in the relish, this dish was able to be appropriately served during the summer season without being too hearty and heavy for the patron. Couldn't have had a better family-style main course than this! Then for dessert, we were served a generous yet precise slice of peach pie with elderberry anglaise, vanilla ice cream, and an almond crunch. What a lovely end to a simple and intensely flavorful dinner. The softly baked peaches inside the pie were not too overwhelming -- just a bit caramelized against the pie's crust and topped lattice. Even Marcus, who isn't crazy about stone fruits AT ALL, commented, "Man, only Thomas Keller can make me like foods that I don't like -- this is actually good!" The orb of homemade vanilla ice cream made it even better, a la mode, as the vanilla bean bits were very fragrant, and the almond crunch added a great nutty texture and taste. If summer could be encapsulated in a single dessert, this could very well be it! 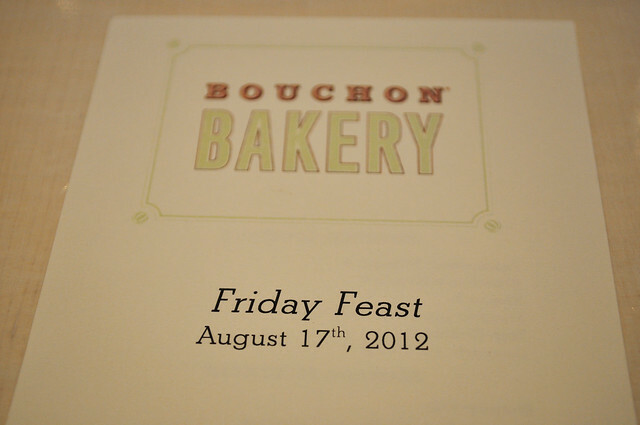 Findings: Once again, Chef Thomas Keller does not disappoint. Each of our courses were prepared to the nines -- composition and flavors worked quite well hand-in-hand with simple and fresh ingredients, recapitulating the last remnants of summer's bounty. Plus, the portions were well divvied -- we left happily full, with neither stomach completely overwhelmed. Service was attentive, and with the prices only $3 above the NYC Restaurant Week dinner prix fixe price, it is quite the bargain for three unabbreviated courses. So try to make it there before the last dinner on Friday, September 28! 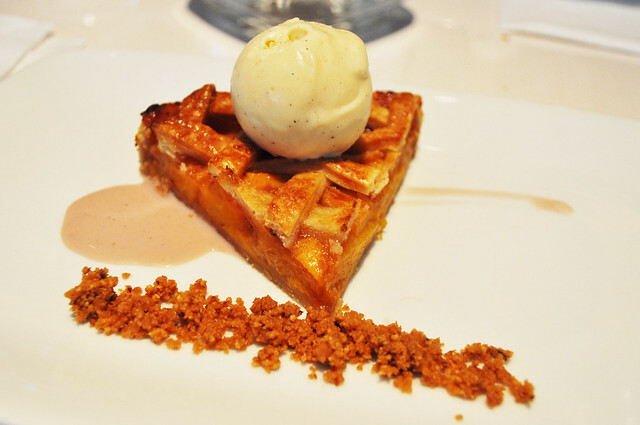 Price point: $38 three-course tasting per person for Friday Feasts, $9 for a glass of sangria. If you have the lucky chance to dine here during its Friday Feasts three-course prix fixe menu, do check it out -- great bargain at $38! Otherwise, lunch is also great here!